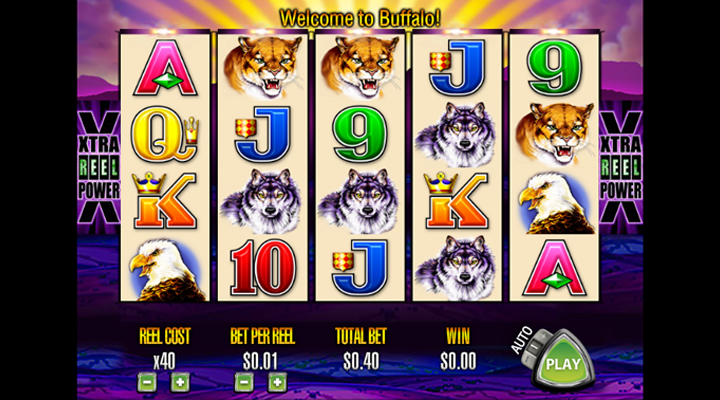 Buffalo Slots is an entertaining game with an old-school theme. It’s most notable feature is Xtra Reel Power, which is also known as “1024 ways to win”. The mix of Xtra Reel Power and the no-paylines setup creates perfect conditions for you to hit big wins. Buffalo Slots is certainly one of the best Aristocrat’s slots. This game has become so popular that the company features several variations of it including Buffalo Gold and Buffalo Deluxe. The graphics are good, nothing special or stunning. The game sounds don’t suit the animal theme at all. However, the Xtra Reel Power feature on the top of Wild and Scatter symbols will make you spin the reels again and again. While playing this slot-machine you can notice one interesting thing: there are no paylines at all. Due to the Xtra Reel Power feature, the winning paylines are created every time the similar symbols appear on the adjacent reels. Overall, there are 1024 winning combinations. As the name suggests, Buffalo is the main symbol, which brings you the highest winnings. Buffalo can appear everywhere and anytime, so that you can get 5 reels filled up with those bulls. You will hear the specific voice of a man crying out “BUFFALO” every time you meet this symbol. Now about some extra symbols. The coin icon acts as the Scatter symbol here. It enables the free spins feature and the bonus game. Three Scatters bring you 8 free spins, four of them bring you 15, and five - 20 free spins. Also, the number of Scatter symbols determines the amount by which your winnings will be multiplied (up to x27). Let’s have a look at the Wild symbol (the sunset). It can turn into any symbol, except the Scatter. This symbol doesn’t appear on the first and fifth reel. So, it can help you to form the most sizable combination, as it can substitute even the Buffalo symbol. Buffalo Slots is much more entertaining than it seems to be at first sight. Despite it’s poor sounds and simple animations, the game has the Xtra Reel Power feature, which increases the number of winning combinations to 1024. Seems that there are no chances to loose. Just give it a try for yourself. Click here to play Buffalo slot - one spin won’t be enough, for sure.